Here are some interesting books on Celtic mythology and religion, the early Picts and Scots, Scottish history from the Stone Age till early Medieval times, including the Viking influence, and Celtic Christianity. Excavations in the Orkneys seem to be turning the archeological world upside down. Just how advanced were these ancient stone-builders? Hedges details discoveries of a clan whose totem was the white-tailed eagle. Engagingly written. 5 stars. Not strictly "on topic" but too fascinating to pass up. Rob Roy not only lovingly describes some of the world's most interesting stone circles, but teaches you how to build them! Want a Stonehenge in your backyard? Wonderful book. 5 stars. Highly recommended. History of the Scots arrival in Dalriada and eventual merging with the Picts as they battle against Anglo-Saxons and Danes. Fascinating historical account of the merging of two peoples into the Scots Highlanders. 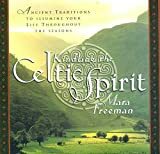 Filled with beautiful illustrations and photographs, this book is a wonderful introduction to Celtic religion and culture. Frenchman Markale, an authority in this field, traces the impact of Celtic mythology on Western history and culture. He argues that Celtic influence is stronger than credited in the modern world. 5 stars. Comprehensive look at ancient Celtic religion, dieties and myths, finding parallels with the Greeks. A classic work of translation and interpretation. Follows the cycle of the pagan Celtic year, providing stories, recipes, rituals and more for each festival. Very informative and well-researched; a great way to bring Celtic religion home. 5 stars. Grand Icelandic saga telling the story of the Viking lords of the northern islands when they still owed allegiance to Norway rather than Scotland. Essential companion for anyone interested in Scottish history. It includes Columba, Macbeth, and William Wallace; Burns Clubs, curling, and shinty; clans, Clearances and Covenanters. Filled with over 300 color photos, this wonderful guide details ancient stone circles, barrows, ancient abbeys and chapels, as well as every castle in Scotland. Explores the Celtic worldview, incorporating the mystical relationships between ourselves and our souls, ourselves and others, ourselves and God. Perhaps the most highly recommended book I've ever come across. 5 stars. Newell traces and explains Celtic Christianity from its historical beginnings up to modern times. Readable and engaging - an excellent introduction to the differences between traditional Celtic and Roman spirituality. 5 stars. Somerled, the great Scottish chieftain, was half-Norse through his mother. Forced into exile in Ireland, he grew up as a warrior hermit, until leading his people against the Norse to regain his family's lands and become Thane of Argyll. His legacy was in fathering the Clan Donald, the creation of the finest galleys ever seen in Scottish waters, and the enduring power base of the Lordship of the Isles. As an outpost of empire, Scotland played a significant, if unusual, role in the Roman world. The south and east were occupied intermittently from AD 79 to the early third century, while the north and west remained outside Roman control. A detailed gazetteer introduces all the major Scottish sites and includes photographs and detailed plans.